This IBM® Redbooks™ publication applies to Version 6 Release 1 of AIX® on POWER® systems. 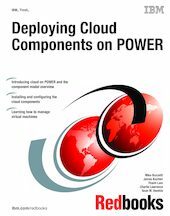 This book is provided as an additional resource as you investigate or consider implementing and deploying a cloud in a POWER® environment in the context of infrastructure as a service. is provided as an additional resource as you investigate or consider implementing and deploying a cloud in a POWER environment in the context of infrastructure as a service. This book is intended for anyone who wants to learn more about Cloud Computing on Power systems.